Ronald L. Hinkle, 81, of Dayton, passed away Tuesday, January 15, 2019. He was born in Cherry Grove, WV in 1938, and was a son of the late Dice and Fannie Hinkle. Ron served his country in the U.S. Air Force. He was valedictorian of the class of 1959 at Davis & Elkins College. 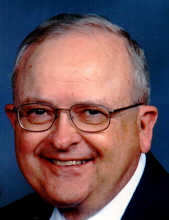 He was a CPA and served as Executive Vice President of Rockingham National Bank. Ron was a member of the Dayton Church of the Brethren where he was a Sunday school teacher, deacon and moderator. He was a member of the Dayton Ruritan Club for 53 years, and served as a past district governor. In 1956, he was united in marriage to Della Hinkle, who survives. Ron is also survived by daughter, Ronda Heatwole and husband Michael, of Dayton, VA; son, Steve Hinkle and wife Mary, of Glendale, AZ; and four grandchildren, David Heatwole, Michelle Heatwole, Stephanie Hinkle, and Jennifer Hinkle. He was preceded in death by brother, Eugene Hinkle. A memorial service will be held at 2:00 PM on Saturday, January 19, 2019 at Dayton Church of the Brethren, with Rev. Kevin Daggett officiating. Burial will be private at Eastlawn Memorial Gardens in Harrisonburg. In lieu of flowers, memorial contributions may be made to the Dayton Church of the Brethren, P.O. Box 236, Dayton, VA 22821 and/or Dayton Ruritan Club, 104 Tiffany Drive, Bridgewater, VA 22812. To send flowers or a remembrance gift to the family of Ronald L. Hinkle, please visit our Tribute Store. Rev. Kevin Daggett officiating. Burial will be private. "Email Address" would like to share the life celebration of Ronald L. Hinkle. Click on the "link" to go to share a favorite memory or leave a condolence message for the family.